No matter where you live, you don’t have to look far to find an unhealthy church. It seems like they’re everywhere. Some were unhealthy from the very start. Others were healthy, even thriving, at one time yet somewhere along the way, warning signs started to show. 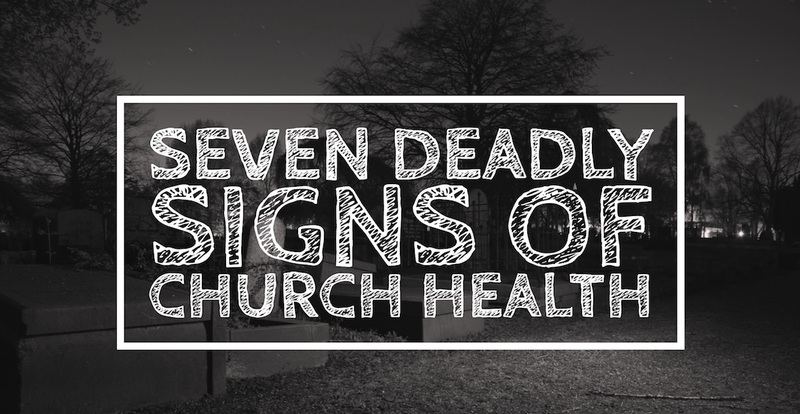 The signs of an unhealthy church can be subtle, especially in the beginning, but over time I’ve found that these seven signs come to the surface of every unhealthy church. No vision to reach those who aren’t followers of Jesus. Most churches would never admit this, and some don’t even realize that they’re guilty of this. Somewhere along the way they lost their vision to reach those who don’t know Jesus. Instead they’ve adopted a vision that focuses on meeting the wants and needs of those inside the church. Once attendance starts shrinking, instead of reaching out, they hold even more tightly to the vision and traditions of the insiders. No signs of spiritual growth. Healthy churches should see signs of spiritual growth, just like a healthy plant should produce fruit. Are there people beginning a relationship with Jesus? Are they being baptized? Are new people signing up to serve? All of these things are rare in unhealthy churches. Many of them aren’t even measuring these things, because if they did, they would have to ask themselves why their church isn’t producing fruit. No desire to ever change or improve. I believe it takes all kinds of churches to reach all kinds of people. With that being said though, if your church is designed to reach an older generation, what do you do when that generation dies off? In most cases, the church dies off too. At some point if what you’re doing as a church isn’t producing the results you want to see, then you need to make a change. And let me say this, if you aren’t focused on making sure children love your church, then your days are numbered. No one takes ownership. I heard a pastor say this, “Our church has owners not members, because members have rights, but owners have responsibilities.” I love that statement. In unhealthy churches, everybody wants to have a vote, but very few people actually want to do the work required to create a great church. Until you get the church to take ownership, you’ll never get the church healthy. No real community. Some small town churches do this very well. They have a great family environment where everyone looks after each other. Others offer a fake style of community in which it’s still a family environment, but this family is full of gossip and backstabbing. Have you ever been a part of one of those churches? I think small groups are the best way to foster authentic community, but I’ve also seen other churches use the Sunday School model just as well. The main thing is creating an environment where people can be open and honest about their lives without fear of judgment. No anticipation of what God might do. Do you remember when you first started reading the Bible? I was twenty years old before I got saved and picked up a Bible, but during that time I was so excited about reading to see how God would speak to me that day. People should come into your church the same way, anticipating what God might speak to them. No numerical growth. I know there are some circumstances in which numbers don’t tell you the whole story. But in most cases, numerical growth is a great indicator of church health. If the community your church is in is growing yet your church attendance is declining, that’s a sign that your church may be unhealthy. Healthy things are supposed to grow. Have you ever been part of an unhealthy church? What did that look like? Leave a comment and let me know. Also, don’t forget to subscribe to the blog to get tips on church growth, leadership, and more delivered to your inbox each week. Also, if you want to turn around your small town church, make sure to pick up my new ebook, The Basics: 13 Steps to Turn Around Your Small Town Church free to new subscribers.